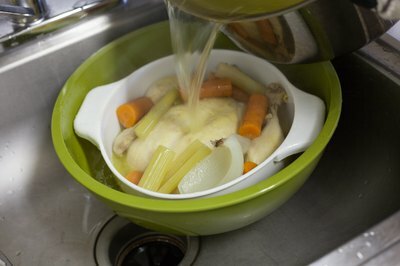 The base for homemade chicken soup is a liquid made by boiling chicken and vegetables in water. Once the ingredients are boiled long enough to flavor the water, they are strained out and the remaining liquid is used for soup. The liquid is referred to as either chicken broth or stock. They are very similar, except broth tends to use just meat, while stock uses both chicken meat and its bones for a deeper flavor; however, broth and stock can both be used successfully in making homemade soup. 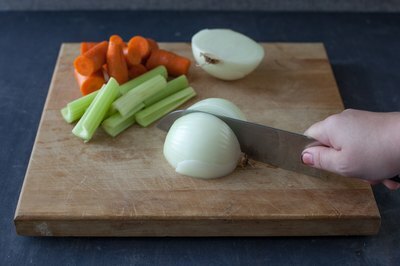 Cut two celery stalks, two whole white or yellow onions and two carrots into large chunks (about four pieces per vegetable). Leave any leaves or peels attached–they will add even more flavor to the liquid. Transfer the vegetable pieces into a large soup pot on your stove top. Place a 3- to 5-lb. whole chicken (for stock) or boneless chicken pieces (for broth) into the pot with the vegetables. 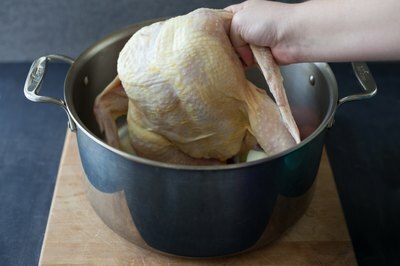 Pour 12 cups of water into the pot (or enough water to cover the chicken by about 3 inches). Set the stove to “medium” and heat all the ingredients until the water starts to bubble. Lower your stove temperature to “medium low” and let the mixture heat for about an hour or until the chicken is cooked through and no longer pink-colored. While the chicken heats, remove any fat or foam that collects on the top with a spoon and discard it. 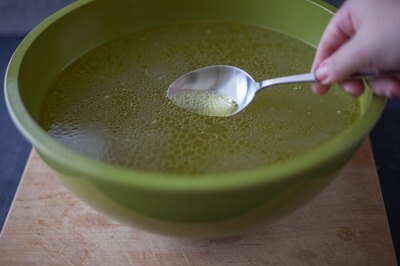 Position a strainer or colander over a large bowl, then pour in the entire contents of the soup pot. Discard the vegetable pieces. 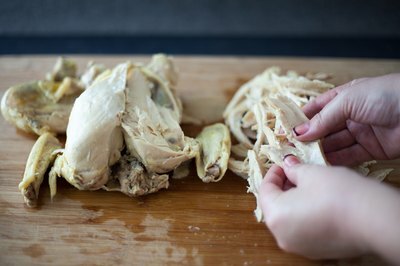 Pull the chicken off the bone and chop it into bite-sized pieces or shred it, then set it aside. Let the strained liquid sit undisturbed for about 10 minutes or until a thick layer of fat floats to the top. Scoop the fat off with a spoon, then discard it. Add the cooked chicken and any other ingredients you prefer into the liquid for soup. Make your stock or broth more flavorful by adding whole garlic cloves or whole sprigs of fresh herbs in with the vegetables and chicken. If you have extra chicken broth or stock, let it cool down to room temperature and store it in an airtight container in your refrigerator for up to three days or in your freezer for up to three months. 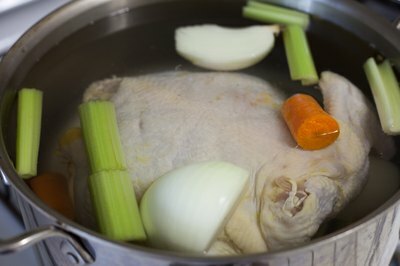 Always let the homemade chicken broth or stock sit undisturbed after it is done cooking for about 10 minutes or until the fat from the chicken floats to the top and you can remove it--leaving the fat in may be visually unappealing and have an overly greasy taste.